Two years ago, responding to customer backlash against high fructose corn syrup, PepsiCo released limited editions of its Pepsi and Mountain Dew soft drinks with real sugar as a replacement sweetener. That eight-week run in 2009 was followed by an extended run in 2010, and now last week an announcement that Pepsi Throwback and Mountain Dew Throwback will be around for good, or at least the foreseeable future. 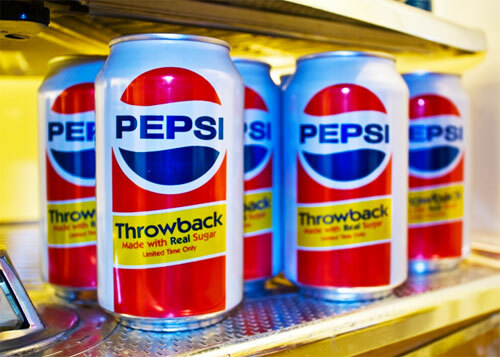 Of course, I’m only speaking for Pepsi Throwback. Mountain Dew Throwback, despite using sugar, still has a mess of oddities in its ingredient listing. Carbonated water, sugar, citric acid, natural and artificial flavor, sodium benzoate, caffeine, gum arabic, brominated vegetable oil, yellow 5.